When it comes to buying Bitcoin, you can find various alternatives to Coinbase. The site is definitely quite reliable and popular but you should also know about the other options which provides cheaper pricing for buying and selling of Bitcoin and other types of cryptocurrencies. The section provides great solutions and competitions to Coinbase as reliable trading platforms. In the recent times there have been great development in crypto world and hence great number of websites evolved in this era. But this is so important to figure out about the reliable and trustworthy options out of all. So, here are the 10 Coinbase alternatives that I picked for this section. Changelly provides you a platform to exchange cryptocurrencies at the best rate possible. Working as one of the phenomenal and reliable Coinbase competitors, Changelly has come a long way and currently works as an excellent crypto buying and selling website. Well, of course the site has their own taking and making charges along with withdrawal and exchange fees too but I think this is quite affordable. The withdrawal fee is just 0.5% on each transaction which is super affordable compared to various other platforms. Their platform is quite safe for making such sensitive transactions and interestingly quite quick too. You can join the site for free and follow their process for switching from one crypto type to another while having hundreds of options by your side. Gemini is a crypto platform which is completely trustworthy when it comes to crypto exchange and transactions. The liquidity of the flow on the platform goes very smoothly and of course with superb security too. Apart from instant buying and selling, the website is a home to storing your digital currency too. With multiple order types and transaction between multiple crypto types, Gemini has got you covered with everything regarding this ever-changing market of cryptocurrencies. One thing that makes Gemini different of all is its dynamic maker-taker fee schedule which brings this fee to almost 0 in timely intervals. There are other charges too like trading fee, selling and buying charges, exchange etc. Apart from direct exchange between digital currencies, you can also convert them into USD too. A big issue with the site is that it does not accept international transfer. Cex has always been the kind of sites similar to Coinbase, which people look forward after Coinbase itself. The site is much more than just buying and selling bitcoins and of course deals in various other crypto currency types too like Ethereum, Dash and much more. The dynamic fee schedule of maker-taker fee lasts for 30 days and gets renewed afterwards. Deposit and withdrawal fee also varies on the basis of the currency type. Apart from USD, the site supports EUR, RUB and GBP. The site also charges margin trading fee which is different for different crypto types. 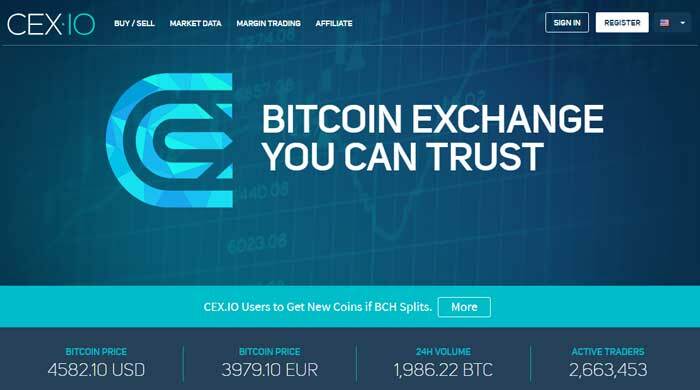 It seems kind of complex to understand different policies of Cex, but as a crypto exchange platform, you are going to find it super smooth and simple. With a really strong security layer over your digital assets and multiple payment options, you are going to find Cex to be quite flexible. Kraken can be an option for you people which can proved to be better than Coinbase itself. In fact, the two has some serious competitions and a lot of services and features to offer. Kraken allows you to buy, sell and trade in Bitcoin and other crypto currencies with some fees and charges incurred of their own. Kraken provides different maker-taker fee for different types of currencies which keeps on renewing after every month. Kraken gives you a platform to establish excellent banking relationships along with your digital currency. It has really low fees as compared to various other sites and you can completely rely on them in terms of security and transactions. You can find multiple other crypto types on Kraken apart from Bitcoin to give you a collective information about them all in a comparative way. Bitcoin market is definitely on a roll and you need services like Binance to fetch up everything. From buying and selling the crypto currency to getting a platform to know about the ever-changing prices, Binance does something more than that. It gets hold on various kind of crypto so you can have a clearer perspective and information about them all. You can also become a part of this site for free but a fee of 0.1% applies on trading. There is also a withdrawal fee which varies for different digital currencies and interestingly, the deposit fee on Binance is absolutely free. Binance lets you know about the exchange information and trading of hundreds of cryptocurrency and make them available for trading on their site. I am sure you are going to love their cross-platform support for sure. Bittrex is different from other websites like Coinbase as it works as a blockchain trading platform based in USA. It is highly recommended for people who believes in lightning fast exchange and does not want to rely on time taking process to save some money. With the backup of digital wallets and high security features, Bittrex goes a step higher than other trading platforms for cryptocurrencies. Bittrex also support syncing with third party trading platforms so that you have to face less hassle while managing it all. However, as their services are top-notch, their fees is also higher than other platforms. Bittrex charges 0.25% commission on trades while there are some other charges too. Although Bittrex is quite versatile in terms of digital currency exchange, it is reduced to only USD conversion and hence do not support international users. While most of the cryptocurrency trading platforms and sites are based in USA, Bitpanda makes a difference as it is a leading trading platform based in Europe. But that does not make it any less of best alternative to Coinbase and it provides complete services of buying and selling of Bitcoin and other cryptos. You can start trading after a verification process and this platform is so easy to get started with as it supports multiple modes of payments. You can now buy and sell digital currency in real time through Bitpanda. The kind of options you will come across on this platform are Ripple, Bitcoin, IOTA, Komodo and many more. The site accepts currency types of USD, CHF, GBP and EUR which I think is versatile enough to support international customers too. Bitstamp claims to be one of the leading platform for buying, selling, deposits and withdrawal of digital currency. It has volume based pricing along with other fees like withdrawal, purchase fee, refunds etc. Bitstamp also support international wire transactions too and hence this makes it a global face. The site supports all major credit cards for transactions and is highly reliable and secure. It provides trading option for Litecoin, Bitcoin, Ether and many more such type of digital currencies. To avail any of the services on Bitstamp, you are supposed to sign up here first. Once you are verified then only you can start the trading on your own. It is completely free to register on Bitstamp as there are no platform charges for the site. CoinCorner is a Britain based exchange site for digital currencies who is known to provide a platform for bitcoin storage and transactions. CoinCorner follows a very simple registration process as compared to the other sites like Coinbase and hence it is easier for you to buy bitcoin here without the need of additional documents. In fact, CoinCorner even allows you to deposit Bitcoin through debit card too while you need a credit card to buy them. Apart from Bitcoin, the site also support other currencies like Ethereum, Ripple, Litecoin etc. However, it is not as diverse as the rest of the sites in terms of trading of cryptocurrencies. The site also has a mobile app which simplifies the functionality of the site. Coinmama is one of the fastest and simplest way to buy Bitcoin and Etherum. Of course, the options are limited on Coinmama but if you are in a mood of small scale trading then the platform is just perfect for you. This Coinbase alternative supports various modes of payments where the spending limit is quite high. Unlike other sites, you won’t have to wait for a week for the verification process, as the documents are verified in an hour after which your account is ready for transactions. In fact, the site does not even ask you for deposits as its process is super-fast which is quite beneficial for small traders. Bitcoin prices change every moment and this is why you really need to catch up with such kind of platforms which can provide you information regarding even a minute change. These are the sites which works as an excellent alternative to Coinbase and provides great support to the users for buying and selling of cryptocurrency.